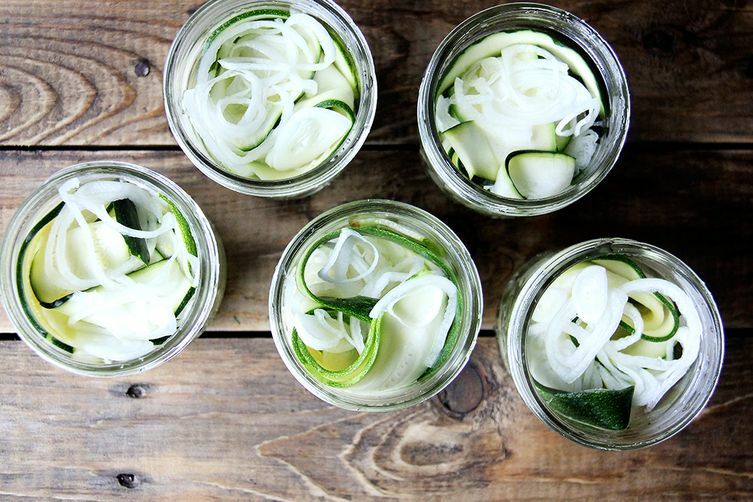 Keep farm fresh produce on hand year-round by mastering the art of pickling. These briny recipes from the McCormick Kitchens should do the trick: Refrigerated Bread & Butter Pickles and Dill Pickle Spears. Today: Put that cucumber down. Here's the vegetable you should be pickling, plus ideas for using up the rest of your market haul. It’s a familiar cry during the summer, but I wasn’t about to complain—I could only hope to find anything as prolific in my garden. And besides, with so many resources out there now, should anyone fear the onslaught of zucchini this summer? From butter to quickbreads, pancakes to gratins, we know how to quickly pare down our haul. And here’s one more to add to your arsenal: pickles. 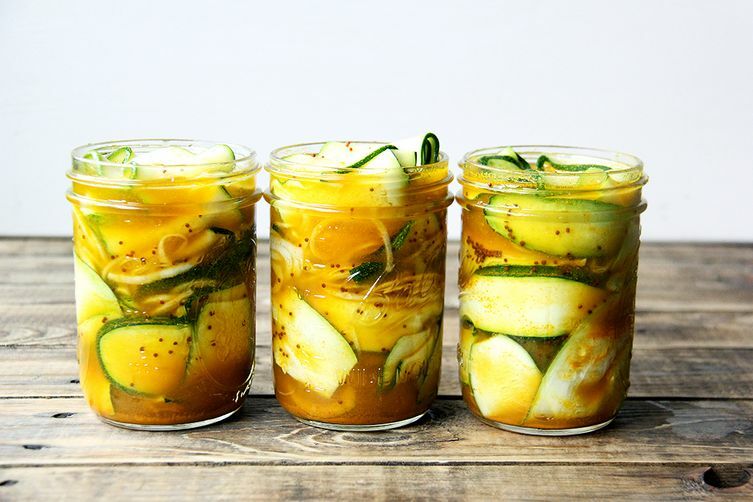 This recipe comes from The Zuni Café Cookbook, which credits the pickles’ intense, saturated flavor to “careful purging” and cold brining: Soak slices of squash in a salt-water brine to draw out its water and cause it to soften. After one hour of this "purging," the squash is primed to better soak up the brine. Remove the squash from the salt bath and then submerge it in a mixture of vinegar, sugar, dry mustard, mustard seeds, and turmeric. Leave them like this for a day in the fridge, and they're ready. In the preface to the recipe, Judy Rodgers notes that this isn’t the recipe (unfortunately) to turn to when you’ve inherited one too many zucchini baseball bats, nor is it a good use for expensive fingerling or baby zucchini. 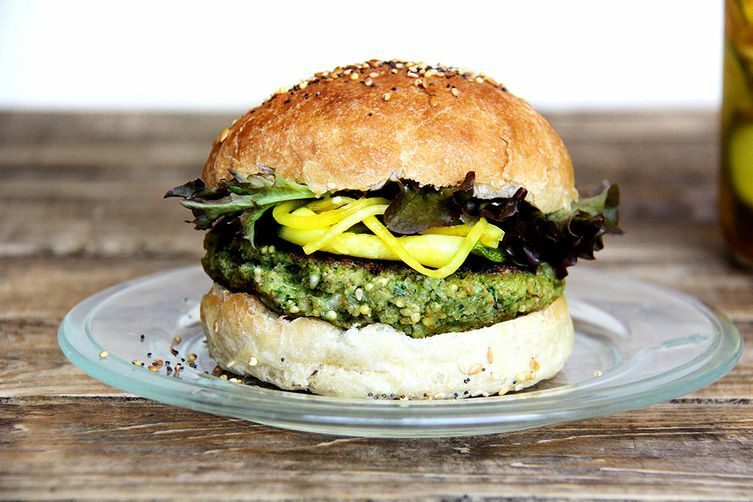 Rogers suggests using firm, medium-sized zucchini or green pattypan squash. On their own, these brilliant yellow, tangy pickles are on the sweet side, which concerned me initially. But after weeks of watching friends and neighbors gobble them up with burgers and sandwiches, I stopped thinking about cutting back the sugar—there is, after all, a reason these pickles accompany every burger at Zuni Cafe. The next time you find yourself with a glut of zucchini, think about preserving them—they’ll never disappear so quickly. 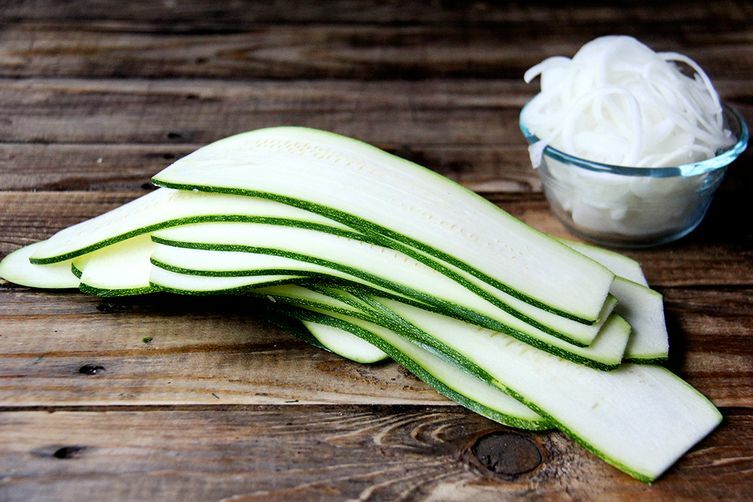 Look for zucchini with smooth, unblemished skin that feel heavy for their size. 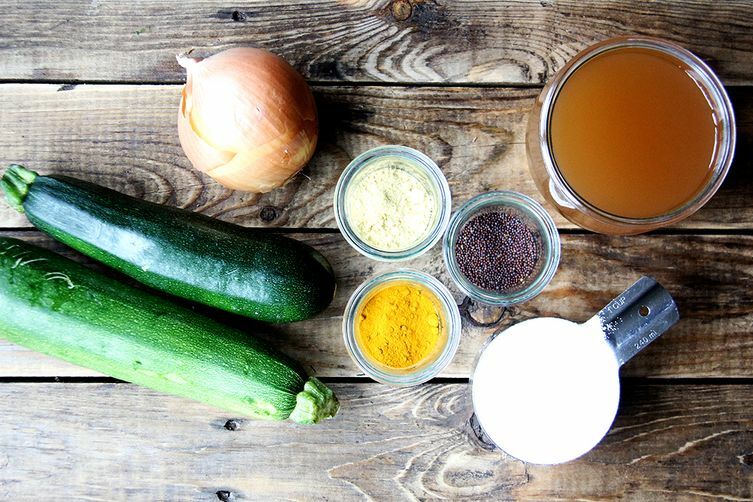 Small- to medium-sized zucchini are ideal—large ones tend to be seedy, watery, starchy, and less flavorful. Store them in an open bag in the vegetable bin of your refrigerator and use within a week if possible. 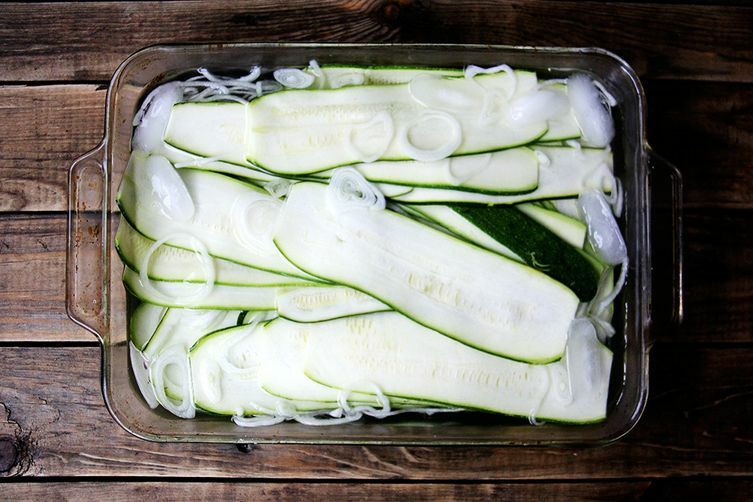 Zucchini can be dirty, so before using, wash to remove any grit clinging to their skins. Trim off each end; no need to peel. 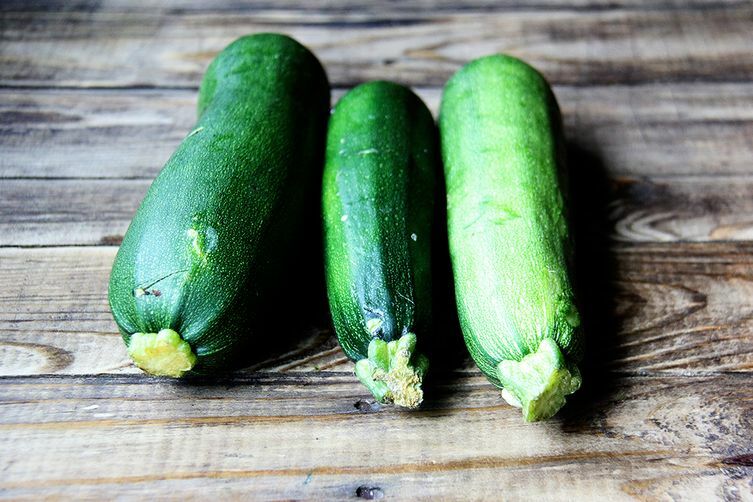 Zucchini can be eaten raw, thinly sliced into delicate carpaccio, julienned into a salad, or finely minced into a couscous salad with shallots, basil, lemon, and ricotta salata. When cut into rounds, sautéed in olive oil, and dressed with a garlic-basil-caper knife pesto, zucchini makes an elegant side dish. For a make-ahead side dish, halve zucchini lengthwise, then roast with a spicy and minty vinaigrette. Finish under the broiler. 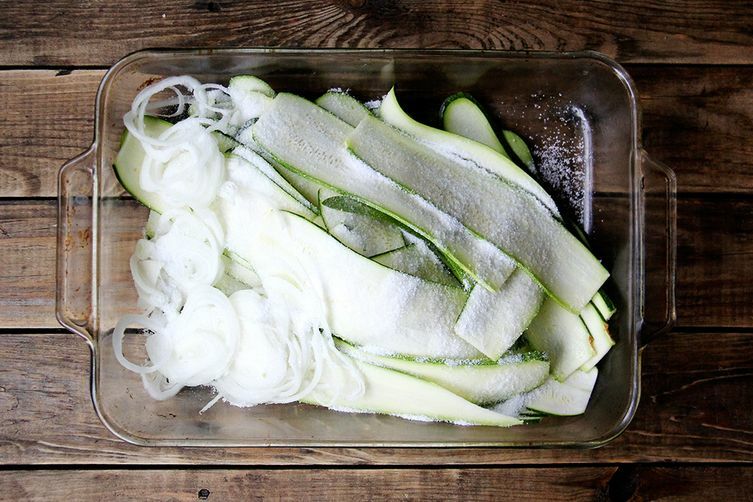 Shred, salt, and drain zucchini then slowly cook it down till it spreads like butter or toss into pasta. Slice thinly, layer with salsa verde, and bake with breadcrumbs overtop—or bake into a tian with a light béchamel. And, of course, bread! Made with rosemary, orange, olive oil, and yogurt, this one is at once light and comforting. Zucchini pickles, here atop Alexandra's herby Turnip Burgers. This article was written by Alexandra Stafford from Food52 and was legally licensed through the NewsCred publisher network.